Photograph of Joseph Davidson With many thanks to John Sheen, from his personal collection. Joseph Davidson was born in Penrith, Cumberland, in 1888. He moved to County Durham where he worked as a teacher, living in Sacriston and West Hartlepool. He enlisted 18th Battalion Durham Light Infantry (DLI), known as the Durham Pals, on 21 December 1914. 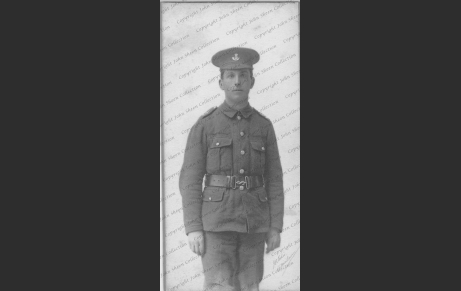 He enlisted in Durham and joined as private 18/988 in C Company. Davidson served in Egypt and France and was wounded on the first day of the Battle of the Somme, 1 July 1916. According to the Bede Magazine of December 1916, Davidson was “wounded in both hands”. After returning from hospital he was posted to 2nd DLI and then attached to II Corps Headquarters. After this, he was put to the 46th Divisional Bath Unit and later to 2nd Divisional Reinforcement Camp. He was finally attached to the 1/1st Yorks. At some stage of his service, he was promoted on a number of occasions, finally to sergeant. At the end of his military service he went back to 18th DLI and then to Class Z Reserve the 15 February 1919. Joseph Davidson died in Durham in 1969, aged 80.